Psychopathological effect of Δ9-tetrahydrocannabinol (Δ9-THC) and cannabidiol (CBD) over time. Plots showing changes in positive symptoms as indexed by Positive and Negative Syndrome Scale (PANSS) positive symptom ratings (A), anxiety as indexed by State-Trait Anxiety Inventory (STAI) ratings (B), sedation as indexed by Visual Analogue Mood Scale (VAMS) mental sedation subscale rating (C), and intoxication as indexed by Analogue Intoxication Scale (AIS) rating (D) under the effect of Δ9-THC, CBD, and placebo over time. Error bars show standard error of the mean. Behavioral effect of Δ9-tetrahydrocannabinol (Δ9-THC) and cannabidiol (CBD). A, Accuracy (left) and reaction time (right) of gender discrimination task across emotional processing (neutral, mildly fearful, intensely fearful) during the placebo or the CBD condition. Error bars show standard error of the mean. B, Accuracy (left) and reaction time (right) of gender discrimination task across emotional processing (neutral, mildly fearful, intensely fearful) during the placebo or the Δ9-THC condition. Error bars show standard error of the mean. Number of skin conductance response (SCR) fluctuations across psychopharmacological challenge. Error bars show standard error of the mean. CBD indicates cannabidiol; Δ9-THC, Δ9-tetrahydrocannabinol. Effect of cannabidiol (CBD) on the brain activation during processing of intensely fearful faces. A, Functional overlay: placebo > CBD. Left side of the Figure is the left side of the brain. B, Correlation between blood oxygenation level–dependent response in the left amygdala during the processing of intensely fearful faces (placebo > CBD) and skin conductance response (SCR). Effect of Δ9-tetrahydrocannabinol (Δ9-THC) on brain activation during processing of intensely fearful faces, glass brain. Functional overlays: Δ9-THC > placebo (top) and placebo > Δ9-THC (bottom). Left side of the Figure is the left side of the brain. Context Cannabis use can both increase and reduce anxiety in humans. The neurophysiological substrates of these effects are unknown. Objective To investigate the effects of 2 main psychoactive constituents of Cannabis sativa (Δ9-tetrahydrocannabinol [Δ9-THC] and cannabidiol [CBD]) on regional brain function during emotional processing. Design Subjects were studied on 3 separate occasions using an event-related functional magnetic resonance imaging paradigm while viewing faces that implicitly elicited different levels of anxiety. Each scanning session was preceded by the ingestion of either 10 mg of Δ9-THC, 600 mg of CBD, or a placebo in a double-blind, randomized, placebo-controlled design. Participants Fifteen healthy, English-native, right-handed men who had used cannabis 15 times or less in their life. Main Outcome Measures Regional brain activation (blood oxygenation level–dependent response), electrodermal activity (skin conductance response [SCR]), and objective and subjective ratings of anxiety. Results Δ9-Tetrahydrocannabinol increased anxiety, as well as levels of intoxication, sedation, and psychotic symptoms, whereas there was a trend for a reduction in anxiety following administration of CBD. The number of SCR fluctuations during the processing of intensely fearful faces increased following administration of Δ9-THC but decreased following administration of CBD. Cannabidiol attenuated the blood oxygenation level–dependent signal in the amygdala and the anterior and posterior cingulate cortex while subjects were processing intensely fearful faces, and its suppression of the amygdalar and anterior cingulate responses was correlated with the concurrent reduction in SCR fluctuations. Δ9-Tetrahydrocannabinol mainly modulated activation in frontal and parietal areas. Conclusions Δ9-Tetrahydrocannabinol and CBD had clearly distinct effects on the neural, electrodermal, and symptomatic response to fearful faces. The effects of CBD on activation in limbic and paralimbic regions may contribute to its ability to reduce autonomic arousal and subjective anxiety, whereas the anxiogenic effects of Δ9-THC may be related to effects in other brain regions. Fifteen healthy, English-native, right-handed men (mean [SD] age, 26.67 [5.7] years; age range, 18-35 years) who had a lifetime exposure to cannabis of 15 times or less, with no cannabis use in the last month, no personal or family history of psychiatric illness, and no alcohol or other drug abuse (see later) or dependence were recruited through advertisement in the local media. Mean (SD) IQ measured using the National Adult Reading Test48 was 98.67 (7.0). 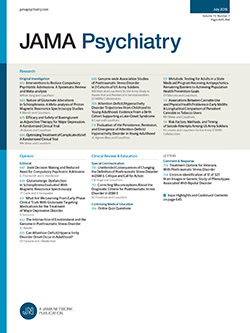 Cannabis and other illicit substance use was assessed using the Addiction Severity Index and drug abuse was defined as “moderate use of small quantities regularly or large amounts occasionally.”49 Participants were requested to abstain from any recreational drug use and medicines for the duration of the study, alcohol intake for 24 hours, and caffeine for 12 hours before each study day. Prior to each session, subjects had urine drug screen analyses for amphetamines, benzodiazepines, cocaine, methamphetamine, opiates, and Δ9-THC using immunometric assay kits. No participants had positive results. The study was approved by the local ethical committee and all participants gave their informed consent. Each participant was scanned 3 times with a 1-month interval between scans. After at least 8 hours of fasting, subjects were instructed to have a light standardized breakfast 2 hours before the experiment. Prior to each scanning session, participants were given gelatin capsules of either 10 mg of Δ9-THC or 600 mg of CBD (both approximately 99.6% and 99.9% pure, respectively, and supplied by THC-Pharm, Frankfurt, Germany) or a capsule of placebo (flour). These were identical in appearance and taste and neither the experimenters nor the participants knew what tablets were being administered in a double-blind procedure. Magnetic resonance imaging (MRI) scans and electrodermal activity (SCRs) were taken between 1 and 2 hours after administration of the drug. Periodic (at baseline and 1, 2, and 3 hours postadministration) psychopathological ratings (mood, Visual Analogue Mood Scale50 [VAMS]; anxiety, Spielberger State-Trait Anxiety Inventory51 [STAI]; intoxication, Analogue Intoxication Scale52 [AIS]; psychotic symptoms, Positive and Negative Syndrome Scale53 [PANSS]) were collected in all participants. Prior to the experiment each volunteer had performed a training session completing all the scales. Blood samples were taken at the same points from an indwelling intravenous catheter in the nondominant arm of each participant to monitor the levels of drugs (CBD and Δ9-THC as measured in the whole blood by Tricho-Tech, Cardiff, Wales). Heart rate and blood pressure were monitored continuously throughout the procedure. All these procedures were conducted by psychiatrists (P.F.P. and S.B) experienced in the clinical effects of Δ9-THC and CBD who monitored participant well-being during the entire session. No serious adverse events (death, hospitalization, emergency department visit) occurred during the study. Three subjects from the original samples (n = 18) had a psychotic reaction (as assessed by the PANSS and clinical manifestation) to Δ9-THC administration and were excluded since they were unable to perform the tests (final sample, n = 15). These subjects were followed up for 24 hours until the psychotic symptoms relieved. They were further monitored monthly and remained well, with no psychiatric or clinical symptoms. Study subjects participated in one 6-minute experiment using event-related fMRI, where they were presented with 10 different facial identities, each expressing 50% (mildly fearful) or 100% (intensely fearful) intensities of fear or a neutral expression (Facial Expressions of Emotion: Stimuli and Tests).54 There were thus 30 different facial stimuli in total; each stimulus was presented twice for 2 seconds. Individuals therefore viewed 60 stimuli in total. The order of facial identities and expression type was pseudorandomized such that there was no successive presentation of the same identity or facial expression type. During the interstimulus interval, the duration of which was varied from 3 seconds to 8 seconds according to a Poisson distribution with an average interval of 5.9 seconds, individuals viewed a fixation cross.55 They were requested to decide on the gender of face stimuli and press 1 of 2 buttons accordingly. Throughout image acquisition, accuracy and reaction times were monitored via button press and recorded on a PC. Other cognitive paradigms were completed at the same time, the results of which are not reported in this article. Images were acquired on a 1.5-T Sigma system (GE Healthcare, Milwaukee, Wisconsin) at the Maudsley Hospital, London, England. T2*-weighted images were acquired with a repetition time of 2 seconds, echo time of 40 milliseconds, and flip angle of 90° in 16 axial planes (7 mm thick), parallel to the anterior commissure–posterior commissure line. A high-resolution inversion recovery image data set was also acquired to facilitate anatomical localization of activation. Functional MRI data were analyzed with statistical parametric mapping software (SPM5; Wellcome Department of Cognitive Neurology, London) running under the MATLAB7.1 environment. All volumes were realigned to the first volume, corrected for motion artifacts, mean adjusted by proportional scaling, normalized into standard stereotactic space (template provided by the Montreal Neurological Institute), and smoothed using a 6-mm full-width-at-half-maximum gaussian kernel. The time series were high-pass filtered to eliminate low-frequency components (filter width, 128 seconds) and adjusted for systematic differences across trials. The onset times (in seconds) for each trial of neutral, mildly fearful, and intensely fearful faces convolved with a canonical hemodynamic response function. Each task condition (neutral, mildly fearful, and intensely fearful) was then contrasted against the baseline condition (cross fixation) for each of the drug treatments (placebo, CBD, and Δ9-THC). A further comparison contrasted all fearful faces (mildly plus fearful) against neutral faces for each drug treatment (placebo, CBD, and Δ9-THC) to control for activation related to processing faces independent of their emotional expression. To test our hypothesis that there were between-group differences, the activation for each task condition was then compared between drugs, using an analysis of variance within-subjects test. Small-volumes correction (sphere of 12-mm radius) was used for clusters observed in hypothesized regions of interest (limbic and paralimbic areas). Whole-brain voxel-wise threshold was set at P = .001, uncorrected, with an extent threshold of more than 20 continuous voxels/clusters.30 Regional activation was reported at a cluster threshold of P < .05 corrected. To investigate the effects of symptom measures (anxiety, intoxication, sedation, positive symptoms) and of the SCR on brain activation, mean change (between 1-2 hours after administration of the drugs, the time when the images were acquired) in the STAI, AIS, VAMS, and PANSS positive symptoms subscale scores and the number of SCR fluctuations (as recorded during the scanning) were, respectively, used as covariates for the contrasts between Δ9-THC/CBD and placebo. Skin conductance was recorded during the fMRI scanning via a pair of silver-silver chloride electrodes with 0.05M sodium chloride gel placed on the distal phalanges of digits II and III of the nondominant hand. The electrode pairs were supplied by a constant voltage and the current change representing conductance was recorded using the DC amplifier. The number, amplitude, and rise time of SCR fluctuations were recorded. A fluctuation was defined by an unambiguous increase (0.01 microsecond) with respect to each pretarget stimulus baseline and occurring 0.5 to 3 seconds after the target face stimulus.56 The fluctuation amplitude was measured as the difference in skin conductance level from the onset (the skin conductance measure before the first rising data point) to the fluctuation peak. The number and amplitude of SCRs were scored using customized software that allows each SCR to be linked to the individual eliciting stimulus. SPSS version 15.00 (SPSS Inc, Chicago, Illinois) was used to analyze performance and questionnaire data. Measures of task performance, symptom ratings, physiological data, and drug levels were analyzed using repeated-measures analyses of variance to compare drug conditions. When significant differences were found, using a significance level of 95%, the Tukey test for pairwise comparisons was applied. Using power calculations,57 we estimated the number of subjects required for detecting significant differences in the amygdala between the placebo condition and the CBD condition with an α (type I error) of .05 and a power of 90%.30 The anticipated within-group SD was 0.035 and the anticipated minimal difference was 0.037; this resulted in a sample size of 12. The physiological and behavioral results are based on ratings made at 1 and 2 hours after drug administration, the period during which the fMRI data were acquired. At 1 and 2 hours after drug administration, the mean (SD) blood levels of Δ9-THC were 3.9 (7.3) and 5.1 (5.6) ng/mL, respectively, and the mean (SD) blood levels of CBD were 4.7 (7) and 17 (29) ng/mL. Compared with placebo, neither Δ9-THC nor CBD significantly affected heart rate or blood pressure at these points (P < .05), although we did identify a (nonsignificant) trend for an increase in heart rate with THC: 1.93 (SD 5.74) beats/min and 8.79 (SD 16.31) beats/min at 1 and 2 hours after baseline. No significant differences were observed between the drug conditions at baseline for any symptom variable (P > .05). Pairwise comparisons revealed that mean anxiety (STAI), intoxication (AIS), sedation (VAMS mental sedation subscale), PANSS positive symptoms subscale (Figure 1), PANSS negative symptoms subscale, PANSS general psychopathology subscale, and PANSS total scores (eFigure) were significantly increased following Δ9-THC as compared with placebo administration (P < .05). Compared with placebo, CBD administration did not significantly change subject rating on any of these measures. However, there was a trend (P = .06) for reduction in anxiety following CBD relative to placebo administration on the VAMS anxiety and tranquilization subscale. There was no statistically significant effect of session order or an interaction effect (drug × session order) on behavioral symptoms. Cannabidiol had no significant effect on gender discrimination relative to placebo. Participants were able to distinguish male and female faces with a mean (SD) accuracy of 83.45% (2.63%) following placebo administration and 83.44% (3.16%) following CBD administration (t = 0.10; P = .99). A main effect for valence was present (F = 16.33; P < .001); for both manipulations, accuracy was better for fearful than neutral faces (all t tests P < .05). Cannabidiol had no significant effect on reaction times (F = 0.241; P = .63) (Figure 2). There was a significant main effect for valence (F = 13.89; P < .01); reaction time was significantly faster when processing intensely fearful faces than processing mildly fearful and neutral faces (P < .05). The interaction between valence and drug (placebo/CBD) was nonsignificant (F = 0.79; P = .48). Δ9-Tetrahydrocannabinol had no effect on the ability of participants to distinguish male and female faces (mean [SD] accuracy of 83.45% [2.63%] following placebo administration and 82.49% [3.86%] following Δ9-THC administration; t = −1.16; P = .27). There was a significant effect for valence (F = 12.63; P = .001), with better accuracy when processing fearful than neutral faces (all t tests P < .05), but no interaction between valence (neutral/mildly fearful/intensely fearful faces) and drug (placebo/Δ9-THC) (F = 0.825; P = .46). Analysis of reaction times revealed that there was a significant effect for valence (F = 7.56; P < .01) but no significant effect for drug (F = 0.155; P = .70) and no interaction between valence and drug (F = 0.22; P = .86). Repeated-measures analyses of the effects of valence (neutral/mildly fearful/intensely fearful) and drug (CBD/placebo/Δ9-THC) revealed main effects of both valence (F = 34.56; P < .01) and drug (F = 23.37; P < .01) on the number of SCR fluctuations and a drug vs valence interaction (F = 7.41; P < .05). Post hoc paired t tests revealed that, compared with placebo, Δ9-THC increased SCR fluctuations during the processing of both intensely and mildly fearful faces but not neutral faces (P < .05). Conversely, relative to placebo, CBD significantly decreased the number of SCR fluctuations during the processing of intensely fearful, but not mildly fearful or neutral, faces (P < .05) (Figure 3). Repeated-measures analysis revealed a main effect of valence on SCR amplitude (F = 4.88; P < .05), with a greater amplitude for intensely fearful than neutral faces (P < .05). There was also a main effect of drug (F = 6.75; P < .05) due to Δ9-THC increasing the amplitude of SCR relative to both CBD and placebo (P < .05). No significant interaction between drug and valence (F = 0.135; P > .05) was found. Neither drug (F = 0.582; P > .05) nor valence (F = 0.506; P > .05) had a significant effect on SCR fluctuation latency. Viewing neutral faces was associated with bilateral activation in the cuneus, fusiform gyrus, inferior occipital gyrus, lingual gyrus, and cerebellum and deactivation in the posterior part of the bilateral superior temporal gyrus. Viewing mildly fearful faces was associated with bilateral activation in the fusiform gyrus, cuneus, lingual gyrus, and cerebellum and in the left parahippocampal, postcentral, and medial frontal gyri. Viewing intensely fearful faces was associated with activation in the left cuneus, the right superior occipital gyrus, the cerebellum bilaterally, the left parahippocampal gyrus and amygdala, the anterior and posterior cingulate cortex, the left inferior and superior parietal lobule, and the right middle frontal, right inferior frontal, and left superior frontal gyri. Cannabidiol did not significantly affect activation during the processing of neutral faces. During the processing of 50% fearful faces, CBD decreased activation in a region in the posterior lobe of the cerebellum bilaterally (lobule VI) but was not associated with any increases in activation (eTable). The most marked effects of CBD on activation were evident when subjects were processing intensely (100%) fearful faces. Cannabidiol attenuated the BOLD signal in a left medial temporal region, which included the amygdala and the adjacent part of the anterior parahippocampal gyrus, and in the anterior and posterior cingulate gyri, the left middle occipital gyrus, and the right posterior lobe of the cerebellum (Figure 4A and eTable). The attenuation of BOLD signal in both the left amygdala and the anterior cingulate significantly covaried with the number of SCR fluctuations while processing 100% fearful faces (Figure 4B). Covarying for AIS and STAI scores had no influence on the effect of CBD on activation in these or any of the other regions. When the analysis was repeated using neutral faces as the baseline condition rather than visual fixation, CBD decreased activation in the left anterior cingulate, right posterior cingulate, left amygdala, and right cerebellum during the processing of fearful faces (mildly plus intensely fearful), but there was no effect on activation in the occipital cortex (eTable). During the processing of neutral faces, Δ9-THC increased activation in a cluster spanning the posterior-middle temporal gyrus and the left inferior parietal lobule (x = −40, y = −56, z = −24; number of voxels = 123, z = 6.05) and was not associated with reduced activation in any region. During the processing of mildly fearful faces, Δ9-THC increased activation in the right inferior parietal lobule and was associated with decreased activation in the left medial frontal gyrus (eTable). During the processing of intensely fearful faces, Δ9-THC increased activation in the left precuneus and in the primary sensorimotor cortex bilaterally but decreased activation in the middle frontal gyrus bilaterally and in the posterior cingulate gyrus (Figure 5 and eTable). Covarying for STAI, PANSS, and AIS scores had no effect on the effect of Δ9-THC on activation in these or any of the other regions. During the processing of fearful faces (mildly plus intensely fearful), Δ9-THC decreased activation in the right inferior frontal gyrus, right superior temporal gyrus, and left medial frontal gyrus and increased activation in the left precuneus (eTable). The present study used fMRI to investigate the effects of the 2 main psychoactive constituents of C sativa, Δ9-THC and CBD, on the neural substrate of emotional processing. To our knowledge, this is the first time neuroimaging has been used to address this issue and the first time the effects of both Δ9-THC and CBD have been assessed in the same subjects. Our main hypothesis was that CBD would attenuate the BOLD response to fearful faces in limbic and paralimbic areas, as well as the accompanying electrodermal response, in line with its anxiolytic effects at the behavioral level.30 Consistent with this prediction, CBD attenuated BOLD signal in response to intensely fearful faces in the amygdala and the anterior and posterior cingulate cortex, regions that play a crucial role in mediating responses to anxiogenic stimuli (see later). Fearful faces presented as in the present study, in which they alternate with neutral faces, provoke a transient anxious response to each stimulus without necessarily producing a persistent elevation in anxiety.55 This may explain why CBD did not have a significant effect on the ratings of anxiety during the course of the experiment, consistent with evidence that CBD can only reduce anxiety if it is already elevated.20,27,29,31,32,40,60 Nevertheless, there was a trend for reduced subjective anxiety following CBD relative to placebo administration on the VAMS anxiety and tranquilization subscale. Although this was not predicted, we also found that CBD modulated activation in the posterior lobule of the cerebellum (lobule VI) during the processing of fearful faces. There is increasing evidence that the cerebellum plays a role in emotional processing.82 Patients with lesions in the posterior lobule of the cerebellum (the “cognitive cerebellum”) can experience a flattening or blunting of emotions,83 and cerebellar activation has been observed in lobule VI in response to externally generated emotions such as happiness, sadness, or disgust.84 This region has also been implicated in conditioned fear,85,86 which is attenuated by CBD87 in animal models. Abnormalities in resting cerebellar activity have been reported in neuroimaging studies of regular cannabis users,88-94 but as this has also been evident in studies involving THC,87,88,92 it is unclear whether the findings in cannabis users were related to an effect of CBD. Cannabidiol and Δ9-THC had distinct modulatory effects on the regional neural response to fearful faces. Cannabidiol attenuated the neurofunctional engagement of the amygdala and cingulate cortex when subjects viewed intensely fearful stimuli and this effect was correlated with a reduction in the electrodermal response, consistent with behavioral evidence that it has anxiolytic effects. In contrast, Δ9-THC modulated activation in frontal and parietal areas and was associated with an increase in anxiety and the electrodermal response. Correspondence: Paolo Fusar-Poli, MD, Neuroimaging Section, Division of Psychological Medicine, PO67, Institute of Psychiatry, De Crespigny Park 16, London SE58AF, England (p.fusar@libero.it). Submitted for Publication: December 22, 2007; final revision received April 25, 2008; accepted May 27, 2008. Author Contributions: Dr Fusar-Poli takes responsibility for the integrity of the data and the accuracy of the data analysis. Funding/Support: This study was supported by grants from the Psychiatry Research Trust, London, England. Dr Fusar-Poli is supported by the Guy's & St. Thomas' Charitable Foundation New Services and Innovations in Health Care. Drs Crippa and Zuardi are recipients of Conselho Nacional de Desenvolvimento Científico e Tecnológico (CNPq) (Brazil) fellowships. Dr Bhattacharyya is supported by a joint Medical Research Council/Priory Clinical Research Training Fellowship Award from the Medical Research Council. Additional Information: The eFigure and eTable are available at http://www.archgenpsychiatry.com.